Quite the showstopper, the capital Q is a defining character in a typeface. The quality of its curves and swash encapsulates the style of a family of letterforms and offers a place to be a little over the top. 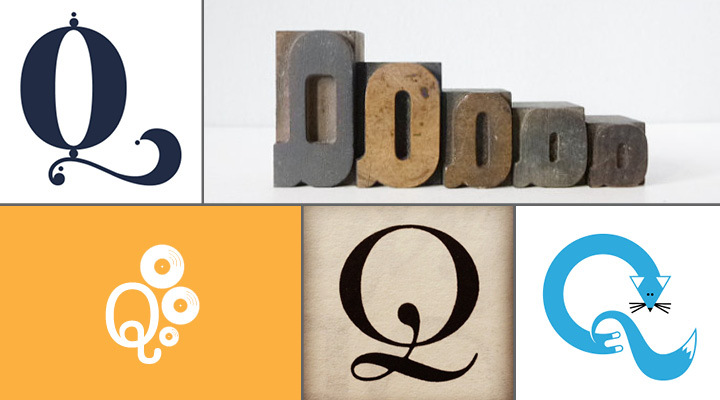 Many typophiles have a mental catalog of which typefaces sport the best Qs... and question marks... and ampersands. Quenching your curiosity: Bembo and Trajan have classic Qs with restrained elegance and flow. Mrs. Eaves, a contemporary serif, quarantines balance within its curves. For the less-is-more camp, you can’t ignore the quietude of the Gotham sans serif Q. No fuss, no muss. Ding! It’s ready. 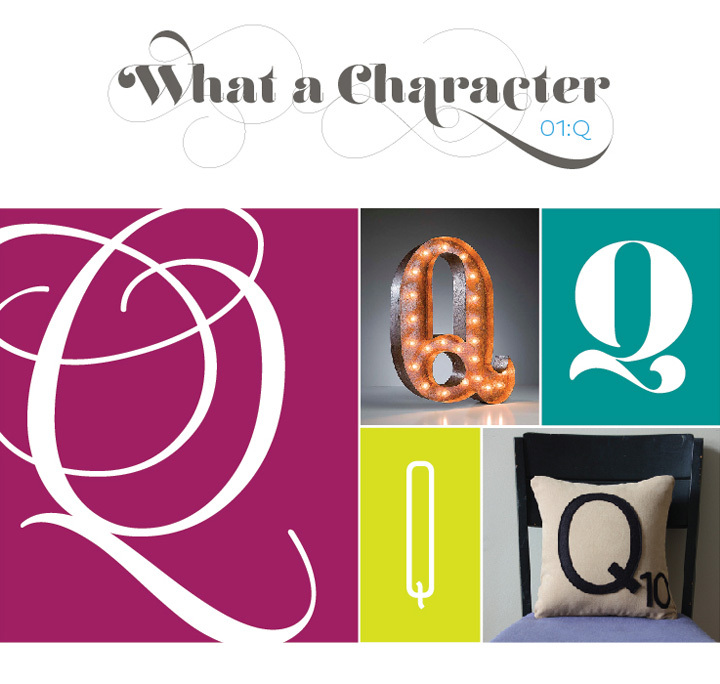 Quintessentially, Q is the perpetual drama queen…not merely an O with ornament. Q’s unique qualities can make it the life of the party. It carries more subtlety than the arresting X or zany Z. Never lacking for companionship, Q does everything with a flourish and travels with an entourage. A loyal companion, the ubiquitous lowercase U is as unassuming as Q is demanding. After all, Q aspires to be uppercase most of the time and can be spotted seeking drop-cap status, though it rarely attains it. It’s fated to be typecast as a character actor. Quirky to dramatic, Q can make or break a game of Scrabble. Carrying the highest value of all the tiles —10 points—draw one early on and you’ll triple-word-score your way to victory. Draw one as the tiles dwindle and you’re scavenging for a well-placed I. Breathe deeply and let the Qi flow. Queerly perplexing is its appearance in the scripts. Taken from old-school cursive handwriting, it appears to be a numeral 2 with flair. Edwardian Script recalls the humble homemade form in a prideful display. The Amish might cringe a little, but you can see the bridge it creates to the contemporary, swashbuckling serif styles. Quasi-essential? Quiet the thought. And thank Q for evolving. If U have been quaking to create a Q too, send it R way and we'll post a few! Check out more of our favorite Qs on Pinterest!